You’ve been dreaming about falling in love forever, and your soul mate is finally by your side. Maybe Cupid has something to do with it, or fate. Whatever it is, at least you’re happy. People say that if you have to ask yourself if he’s (or she’s) the one, then, it’s not the perfect match. When you meet your true love, you’ll just know. Valentine’s Day is approaching, and you’re probably wondering how to prepare for the holiday. It’s become a tradition for people who are in love to exchange presents or to plan something special for the day. What’s really important is that all these are gestures of your love for each other. The thing of major importance here is that you’ll have the chance to spend some quality time together to Valentines Day Flowerscelebrate your love. Another typical thing is to give flowers and heart-shaped balloons. There’s no chance to miss them because everyone you meet on the street will be carrying either red roses or a red heart-shaped balloon, or maybe both. As long as people enjoy things like that, they’re not outdated. Stuffed animals are also quite popular around Valentine’s Day. Don’t forget about chocolate, either. Which one of the things enumerated above can combine qualities like a sweet scent, natural beauty, many colours, the ability to improve somebody’s day and to arouse admiration at first sight? Flowers, of course! 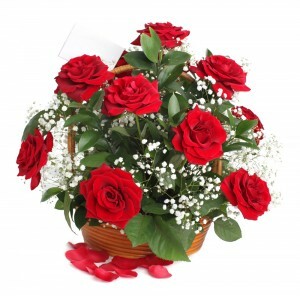 Flower Shops can assist you in making the right choice when you have to send Valentine’s Flowers to your loved one. Our advice for you is to choose wisely, keeping in mind the preferences of your other half. A good thing to do is to try to find out what his or her favourite type of flowers is or the colour that they like best. Then, you can order a flower bouquet from our company explaining to us exactly what your idea is. The other option is to just tell us the flower type or the colour, and we’ll create something on our own. 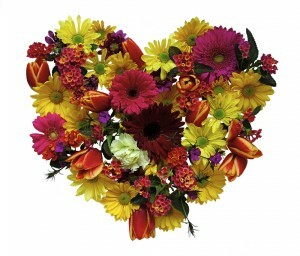 Our professional florists can even make a flower bouquet that looks like a heart from above. Rest assured that your loved one will be enraptured with our flower arrangement. Valentine’s Flowers are like no other because they’re given on a day that’s intended for celebrating love. Whatever flower bouquets you order from us, they’ll be the messengers of this wonderful feeling, and we’re glad to make our contribution to such an emotional moment for you. The size of the bouquet doesn’t matter as long as it’s chosen by you with the thought of the person it’s meant for. Don’t hide your feelings and don’t think that the other person is aware of them. Make little gestures like this one to express them. Flower delivery is a convenient service especially when you don’t have enough time to go to the florist’s. If you pick up your flowers from there early in the day, they might wilt when the time to give them comes. With us there’s no such danger because when you order flowers and give us a certain hour that suits you, we’ll arrange them a little before they have to be delivered. Thus our flowers will stay fresher and will look better upon arrival. Usually, around Valentine’s Day we’re quite busy, so hurry up and place an order. Think of your loved one as that one special person that can give you warmth, affection and most importantly – love. And make sure to show her how extraordinary she is in your eyes by giving her Valentine’s Flowers. Any question regarding flowers is within the realm of expertise of Flower Shops. We are waiting for your call on ‎020 3900 2440. Their prices are exceptional compared to other flower shops in . The quality also is much high. used your services this valentine. When I called Flower Shops, I told them what I really wanted, and upon delivery, everything was just as the florist on the phone described in my own words. I was just amused at how they know to read a person's mind and deliver just at their customers imagine.